Peldi wanted to stay solo like many of his internet idols (Andy Brice of Perfect Table Plan, and Patrick McKenzie of Bingo Card Creator) but the market just wouldn’t cooperate with him. Soon the company had 6 people and over the years Peldi (reluctantly) grew Balsamiq to a team of 21 people in a business that did over $6,400,000 in revenue in 2015 with 30% profit margins. Not bad for somebody who just wanted to learn a bit, is it? Above all else, Balsamiq treats their team and their customers very well, and constantly gives back to the community. They said it best, “In short, we’re good people, and we care.” Peldi and company won’t change the product or the business if it forces them to compromise on who they are and doesn’t have a clear benefit for the customer. Optimizing their free trial fits right in with those goals. Creating a high performing trial can make a tremendous impact on the profitability and growth of a business because it makes it cheaper to acquire a customer, and you are able to acquire more customers from the same amount of traffic. Sound pretty good, right? But it also benefits the customer. While there are gimmicks to improve the trial conversion rate like requiring a credit card upfront and making it difficult to cancel, that isn’t where the real gains are found (in fact, those changes will hurt your business in the long run, even if the conversion rate goes up, but that’s another story). The way to really fix your free trial is to structure it in a way that helps your trial users find value as quickly as possible. If they find value, not only are they more likely to become a paying customer, but you have actually helped them so they’ll stay a customer. 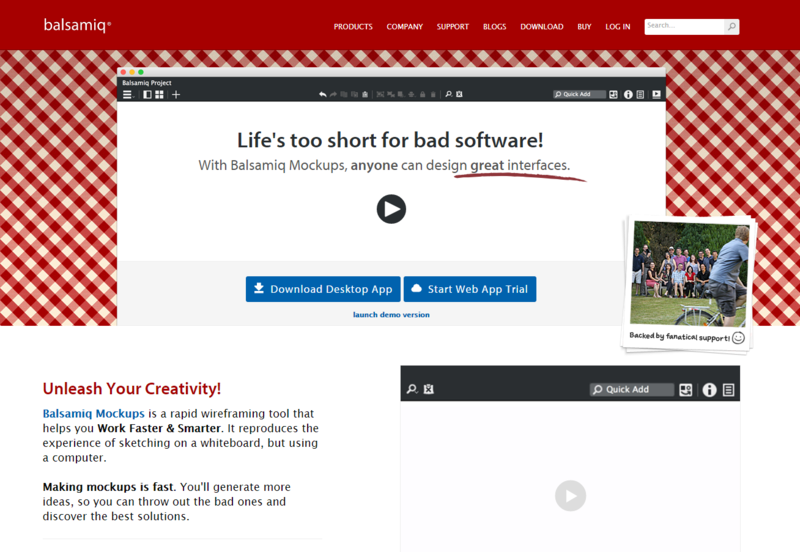 Balsamiq builds mockup tools that are loved by thousands of customers around the world, but with a few changes to their free trial, I think they’ll have the opportunity to help even more people experience the joys of good software. This teardown will take you through all of the steps a user takes when trying the SaaS version of their tool, myBalsamiq. I’ll include comments on what the team currently does well, and where I think they can improve. On the homepage there are two strong calls-to-action (CTAs), “Download Desktop App” and “Start Web App Trial.” The trouble here is that it isn’t really clear what I should do. Are the both the same product just in different forms? Does the desktop app have a free trial? If I’m new to Balsamiq, this is already making me do a lot of thinking. It may not sound like a big deal, but the more friction in the process, the fewer signups you are going to get. The desktop version is currently the bulk of their revenue so I’m not suggesting they get rid of it, but to help accelerate the shift to SaaS (which they are already seeing), I would de-emphasize it by placing a smaller button or link below the SaaS button that says “Try the desktop version." Now, “the site” is the URL you’ll use to sign in, but that isn’t clear upfront and seems unnecessary. 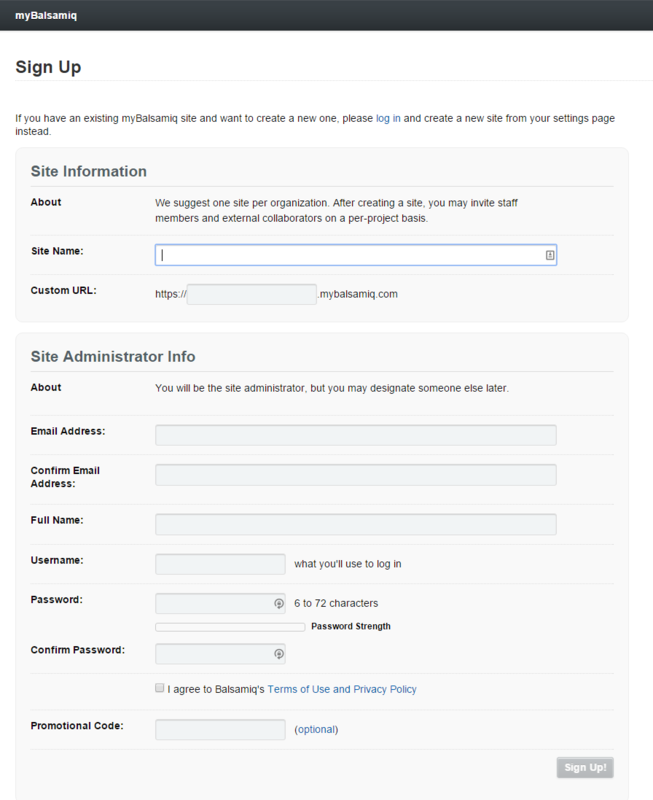 If somebody is just trying to make an account so they can create wireframe mockups, they don’t want a site. While best practices change and don’t apply across the board, generally speaking you should remove unneeded fields on a signup form. If we are already asking for a site name, just use that for the custom URL and auto-populate it below the field so they know how the name will be used. Is there a need for a username? Is it used places other than just to login? Currently they allow you to login with your email address, so unless it's necessary for other parts of the process, I wouldn’t ask for a username. It's just one more thing for people to forget and if they forget, most will just move on. Most apps just show their users a blank dashboard with no instructions, so Balsamiq is already doing much better than that by laying out steps to take and offering resources for more help. That being said, the goal of the free trial is to get the user to find value in the software as quickly as possible, and I’m not sure these steps are arranged to encourage that. First, uploading a photo doesn’t provide the user anything. It may give them a feeling of being more committed to the product which helps keep them around, but it doesn’t actually give them value. This is something to do after they’ve found value. Second, getting your trial users to invite their team into your app is one of the best ways to increase the conversion rate, but there isn’t a reason for anybody to be invited yet. With some tools, having the whole team is necessary to even use the app, but with Balsamiq that isn’t the case. Why would I invite somebody when all I’ve done is upload my photo? People sign up for myBalsamiq to create mockups, and to do that they need to first create a project. With that in mind, the first step should be “Add a project,” then invite their team, and then upload a photo/create their profile. To do this, we need to change the welcome screen itself and also build reminders into the emails that we send during the trial to help encourage those actions. I started two trials with Balsamiq to see how they approached different types of users. On one account I created an empty project and never logged in again, and on the other account I created an actual mockup inside the project, saved it, and didn’t login again. My goal here was to see if they would prompt me to take another action, or even just come back. I eventually invited another team member to see what that email looks like and see what happens if the team member doesn’t accept the invite. Both trial users received the same emails. The trouble with this is that these are two very different users. One signs up, plays around for a few minutes, and never comes back. While the other actually seems to be trying to use the product more seriously. The more you can customize your messaging to the specific circumstances of your users, the more likely you are to get them to buy. Sent as soon as a user starts a trial. I like that the email starts by making it clear when the trial expires, because after a few days it can be easy to forget. Once we get past this point in the email though, there is a lot going on. When crafting a trial, you need to ask yourself, “What is the one thing our users need to do to get closer to their desired outcome?” Then your job is to help them to take that step. With myBalsamiq, that goal should be to get them to add a project so they can create a mockup This needs to be in the first email and prioritized above everything else. 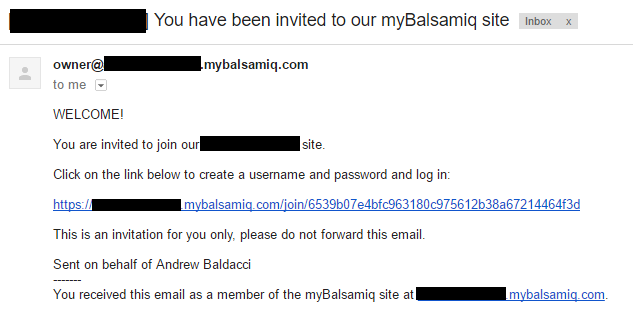 The email starts off saying “Hi, this is Peldi…” but it is sent from “sales@balsamiq.com” and is signed by “The Balsamiq Team.” Having an email introducing the founder is great, but this one doesn’t make it clear that Peldi is the founder, and it also is clearly not from Peldi. I would send these emails directly from somebody on their team, likely Valerie who handles sales inquiries and support questions, and could introduce herself as such. Adding a personal touch is great, but it needs to be consistent throughout the email in order to seem genuine. Lets them know they can reply to get help. First, there are 3 weeks of radio silence between this email and the welcome email. They need to use that time to help their users find value in the product. Balsamiq is a very successful company and people rave about the product, so it is clear that many are able to find this value on their own. However, there is also a large group of people out there who could find value with the product, but need a few nudges to help get them started. Give them those nudges. 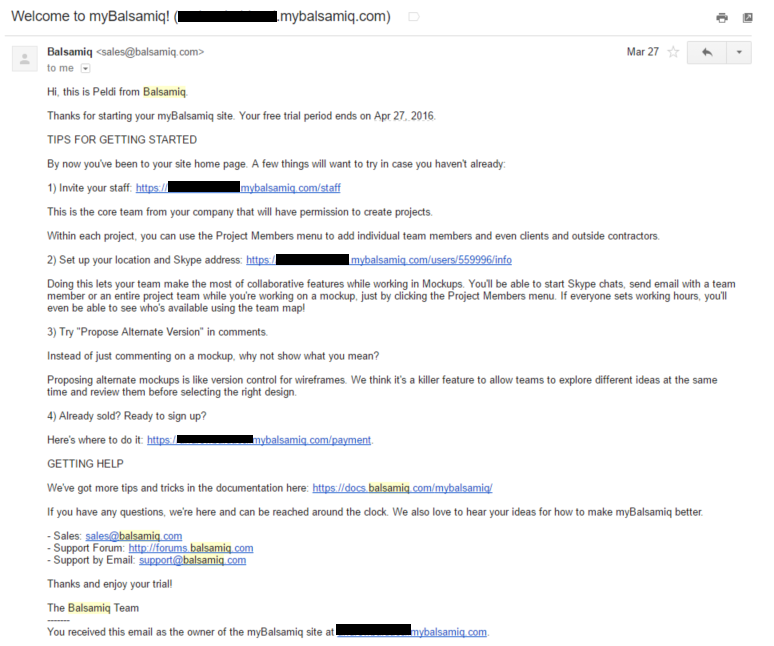 Second, by sending the same email to all of the trial users, they are losing an opportunity to customize their pitch. In any free trial, there are going to be segments of users who are a near certainty to convert, those who rarely convert, and many segments in between. Each of those segments needs something different to get them across the finish line, and with the right emails, you can give them that. For the segment that is most likely to convert, just give them a strong CTA to buy. They’ve already found value with your product, so getting them to pay won’t be difficult. This could be users who have logged in the most frequently, created the most projects, invited their team, etc. For middle segments, there are probably some features that they haven’t used yet, but once they do they become more likely to convert. This would be things like inviting their team or using the “Propose Alternate Version” feature. For the least likely to convert segments, they probably need something more. For them I would recommend sending a simple message with the goal of getting a reply so you can customize your help. Ideally you don’t wait until the last week of a 30-day trial for this, but it is much better late than never. Sent after the trial has ended. I’m up in the air on whether you should email the day before the trial ends (so there aren’t any surprises), when the trial ends (to motivate them more to act), or both, but I think that is a good area to do some testing. One area I am confident about is that the trial extension link should be removed. This is likely going to cannibalize sales because many users will realize that they could effectively get another month free just by clicking a link. Beyond that, it also removes the deadline aspect of a trial which typically helps motivate people on the fence to make a decision. Kicking the decision 30 days down the road is likely the easiest thing for a lot of them, so they are going to do it, and the Balsamiq team will have to just cross their fingers that something changes this time around and they decide to buy. That leads into my last point. I don’t think trial extensions are bad, but I do think automatic ones are. If the user didn’t find value the first time, what will make the second time around different? People often request an extension because they are busy, but will they really be any less busy next week? If you offer trial extensions, it is crucial that you do one thing before granting it: ask the user what they hope to accomplish. Once you have that information, then you can actively help them achieve their goals instead of just hoping this time around will be different. Sent to somebody when they have been invited to join your team. Almost nobody pays attention to these emails, but if done right they can really move the needle on your conversion rate because once somebody has their team onboard the likelihood of them converting goes way, way up. Most invite emails are written and sent as something happening between the app and the invited user, when really it is between the inviter and the invitee. Instead of saying “You have been invited…” say something like “Andy needs you to…” and reiterate that type of language throughout the body and landing page. Who is inviting you? Why? When the email looks impersonal like this, open rates and ultimately the invite acceptance rate will be low. Additionally, don’t just send one email and then leave it to the inviter to keep track and resend it. Automatically send the invitee a reminder to make sure it gets read. If they don’t accept the invitation after 1-2 follow-ups, then consider letting the inviter know so they can speak to the invitee directly. Overall, the myBalsamiq trial campaign is similar to what you see in most SaaS startups: simple and informative. When you have a great product like they do, this can be enough to build a real business and it’s clear that it has done that for Balsamiq. But if you don’t optimize it beyond this, you are leaving money on the table. Peldi and his team have built a unique company that isn’t trying to take over the world, and they are quite content with their steady growth. They should be proud of that growth because they have built a company that brings in almost $6.5 million dollars a year with 30%+ margins, allowing them to provide 21 people a great living and thousands of customers great software. That being said, the Balsamiq motto is “Life’s too short for bad software” and by implementing these improvements to their free trial, they can make sure that more people are able to be saved from bad software. Could you use help with your free trial? My Trial Blueprint service does exactly that, saving you hours upon hours of time you don’t have by doing all that work and giving you a step-by-step plan you can hand to your team to execute, knowing the result will be a free trial experience that accelerates your growth instead of slowing it down. Is that something that would help your startup? Go here to learn more about this custom service, and how we can get started turning your free trial around and accelerating your growth.